Summer is a perfect time for walking in the city or outside it: short walks to very long (96 miles along the Peddars Way and Norfolk Coast Path anyone?). 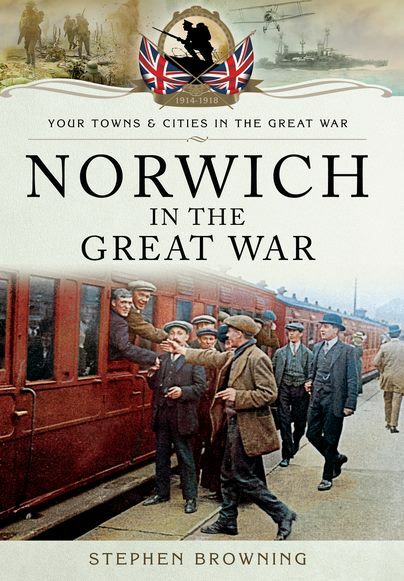 However, as it is 100 years since the Great War, here is an idea – an outing looking at some of the Fine City’s notable connections to the ‘War to end All Wars’ as it was known. TIME: maybe half a day, depending how long you linger in the Cathedral, Norwich Castle Museum etc. WALKING CONDITIONS: pretty easy with some gentle slopes and cobbled areas. This walk begins at the newly refurbished site of the Edith Cavell statue outside the Erpingham Gate to the Anglican Cathedral in Tombland. Edith Cavell was a nurse who was born in Swardeston, just outside Norwich, where he father was vicar for 45 years. He was, by all accounts, a quite severe man who did not consider that we were put on this earth to enjoy ourselves but that, if we served the Lord well enough, enjoyment might come later. He was kind, though, and practised what he preached: the Christmas lunch at the vicarage was divided into two, half for the family and half for the destitute of the parish. Edith nursed him in his final years and it was this that convinced her that her vocation was to be a nurse. When war broke out in 1914 she was in charge of a hospital in Belgium and told her staff that it was up to them to help anyone, including the enemy. ‘Patriotism’, she famously remarked on the night before she died, ‘is not enough’. She helped over 200 soldiers, mainly from Britain, to escape capture. Perhaps inevitably she was found out, tried by a German court on the laughable charge of treason and sentenced to be shot. To the horror of the world she was executed on 15 October 1915. After the war her body was brought back to England and buried alongside Norwich Cathedral. Take a walk to the east and see her resting place, always immaculately tended by present day citizens. Whilst in the Cathedral you can see a window dedicated to the soldiers of Norfolk who fought in the Great War: This will be found as you go around the Nave, on the left hand side walking away from the spectacular West Window. Carry on and you will come to St Saviour’s Chapel, dedicated to the Royal Norfolk Regiment and holding their colours. Leaving the Cathedral and proceed up Tombland – nothing to do with tombs, by the way, but deriving from the Norse word for ‘empty space’ – and turn right by the Royal Hotel. You will see G. Wade’s statue of Peace sheathing her sword, which was erected to celebrate victory in the Boer War. Walk past the Castle keep and turn left into the entrance. There is a fine collection of memorabilia from both wars here. One touching exhibit is a long silver whistle, gifted to the Royal Norfolk Regiment and now enclosed in a glass frame, the description of which reads: ‘This whistle was played by Sergeant E.C. Hoy on Christmas morning 1914, the occasion of the unofficial truce on the Western Front around Ypres’. This was the morning when the British and Germans on the Front lay down their arms and some exchanged gifts including chocolate (surely some of Caleys’ from Norwich here) and tobacco. Others played football. There is a report from one part of the front that, as midnight approached the Germans sent a message to the Allies saying sorry, but they would soon have to begin firing again – could the British please keep their heads down to avoid accidents? Leaving the Castle take a left up past the Bell Hotel and another left into Surrey Street. A short way up you will see one of George Skipper’s masterpieces, the HQ of Norwich Union, now renamed AVIVA. You can go inside and marvel at the sumptuous marble interior – apparently George Skipper was able to purchase an unwanted order of Italian marble originally destined for London. This building was used as a watch tower for Zeppelins. Several hundred employees also signed up, the company promising both that their wages as soldiers would be topped up to the extent of their normal pay and that their jobs would be kept for them until the war was over. Leaving AVIVA make your way back to St Stephens Street and turn left, and then take the zebra crossing over and into Chapelfield Shopping Centre. This was the site of Caleys, who made hundreds of thousand s of bars of their famous marching chocolate for the troops. The firm was later bought by Nestle but the marching chocolate can still be obtained (hint: I bought some recently and it is wonderful). Go up to the top floor and leave by the doorway leading past the side of the Assembly House and cross the street to the Forum. This houses a fine library, including the Colman collection – there are many excellent books, some almost priceless, about the Great War. Opposite is the Church of St Peter Mancroft, whose bells rang out in 1918 to celebrate the Armistice – as they have for many other occasions of national importance, including the defeat of the Spanish Armada, the victory of Nelson at Trafalgar in 1805, and that of Wellington over Napoleon ten years later. Walk in front of the ‘new’ (actually it was never finished as you can see if you nip around the back) Town Hall of 1939. Look at the front doors for some fine metal artwork including two plaques – one commemorating the making of aircraft by Boulton and Paul and Mann Egerton in the Great War and another the production of wire netting (unlikely, I know, but of huge importance at the time to the Fine City’s economy). Opposite is the Memorial to the dead of both wars and, behind it, a sculpture commissioned by the City Council in 2010: Breath by Paul de Monchaux – ‘The Living Honour the Dead, Only a Breath Divides Them’. Carry on and turn down past the original Town Hall, built in the early 15th Century and now mercifully devoid of scaffolding. Here is the scene of a famous celebration – of Harry Daniels VC, who given a reception here when he came back from the Front. Ahead of you is Jarrolds which played a key role in the war, not least because the family, still in charge now, also ran a printing works at that time which was placed at the disposal of the government producing hundreds of thousands of patriotic books like ‘Shell Shocked’ which told the tale of a blinded soldier and sold in Harry Potter-like quantities at the time, and everything from guides for RAF pilots to maps and notebooks for the troops overseas. By the by, this store was also designed by George Skipper. Walk up Gentlemans Walk. The Market Place on your right was, as might be expected, a key area for the mobilization of troops and activities of all kinds. Take a left into another of George Skipper’s masterpieces, the Royal Arcade. Half way up on the right is Colman’s Mustard Shop. Colmans played vital part in the war, from its headquarters down on Riverside. Men signed up in their thousands and the women famously took over their jobs wherever possible until their hoped-for return, which tragically very rarely occurred. They also sewed sandbags and did absolutely any other work requested that they could. It is a tenuous connection but you will, on this walk, have passed several shoe shops. Nothing special in that, you may well say, but it is a quiet reminder of possibly Norwich’s greatest contribution to the war which was in making (literally) hundreds of thousands of pairs of the perfect marching boot for the British and Allied armies. The factories were slightly farther out of the city in areas such as Coslany (the site of the famous Howlett and White firm still exists in Colegate and is in part now the Jane Austin College). The Germans were in awe of their quality and would go to almost any lengths to get hold of them. Anyway, we end this walk here in Colmans Shop situated, fittingly, in the exquisite arcade of one of the period’s and Norwich’s architectural heroes. If you like you can carry on up past the Castle and down the slope until you reach Riverside where firms vital to the war effort had their headquarters. But that is another fascinating walk altogether!